I was leafing through the beautiful pages of a new chocolate book given to me by my thoughtful partner, over a cup of coffee, looking for inspiration and new chocolate challenges. The photography in this book is absolutely stunning, filled with pictures of impossibly tall, mouthwatering chocolate structures, but the picture of the dark chocolate macarons was what really got my salivary glands going. They are ubiquitous in every high end pâtisserie and chocolatier’s shop I have visited. They are about the size of a large bonbon. They come in a range of colours, from pretty pastel to neon. They cost a small fortune to buy. And, apparently, they are deceptively difficult to make well. 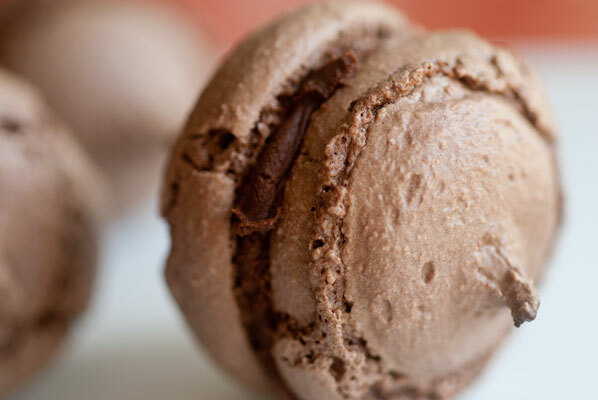 A macaron (French pronunciation: [makaˈʁɔ̃]) is a sweet meringue-based confectionery made with egg whites, icing sugar, granulated sugar, almond powder or ground almond, and food coloring. 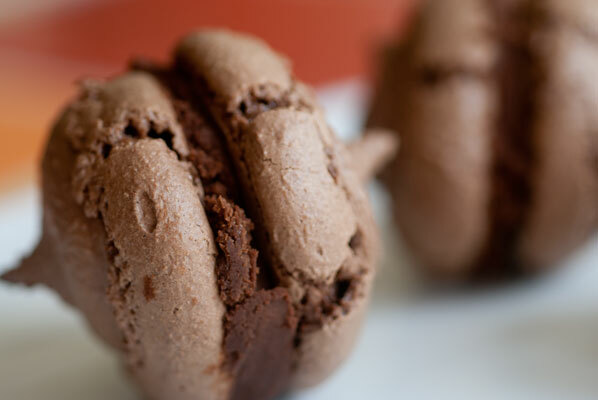 The macaron is commonly filled with ganache, buttercream or jam filling sandwiched between two cookies. Its name is derived from the Italian word maccarone or maccherone. The confectionery is characterised by its smooth, domed top, ruffled circumference (referred to as the “foot”), and flat base. It is mildly moist and easily melts in the mouth. 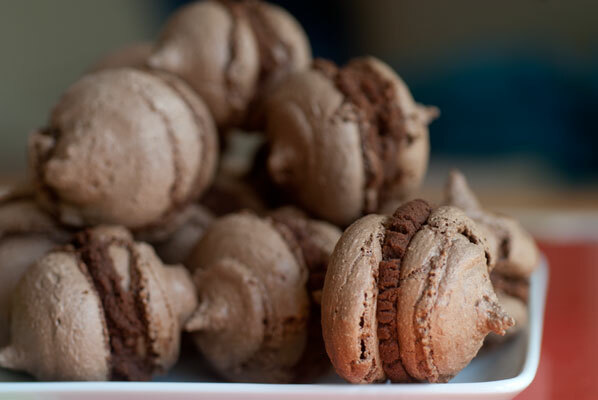 In the 1830s, macarons were served two-by-two with the addition of jams, liqueurs, and spices. 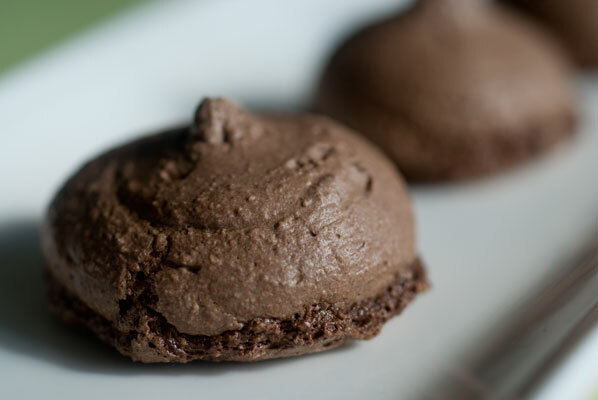 The macaron as it is known today was called the “Gerbet” or the “Paris macaron” and was created in the early 20th Century when Pierre Desfontaines of the French pâtisserie Ladurée, had the original idea of the double-decker, sticking two macaron shells together with a creamy ganache as filling. 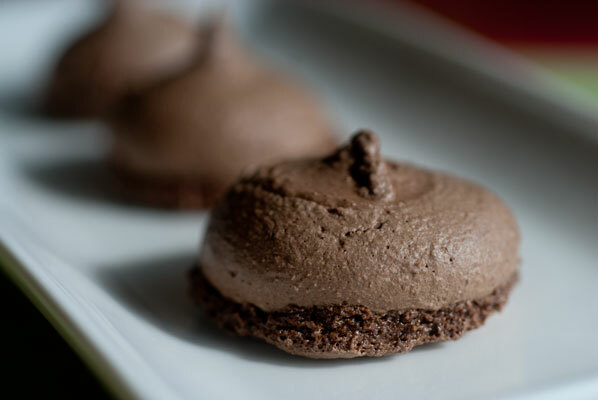 The Paris Macaron comes in all sorts of flavours, but being a student of Ecole Chocolat, I am going to attempt to master the chocolate macaron avec dark chocolate ganache. Pretty much anything which gives me an opportunity to make ganache is irresistable. The chef’s impeccable credentials and encouraging sidebars won me over. A quick look at the ingredients needed: straightforward, with one eccentricity. It struck me as a leetle over the top to use mineral water in making a simple syrup (boiled sugar and water) so I opted to use plain tap water. I scanned the recipe. 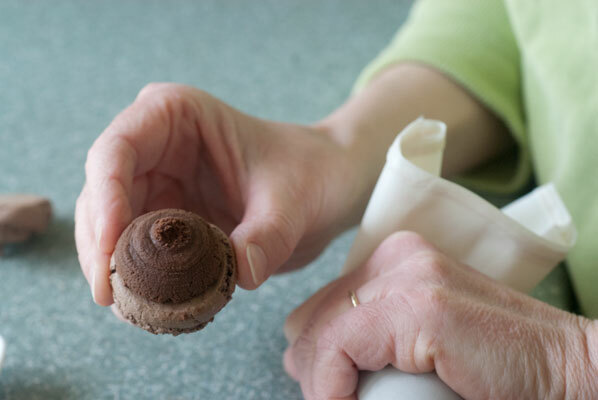 Made sense … until the step where the meringue is made. According to this recipe, one half of the quantity of egg whites are beaten, the hot syrup is poured into them, the dry ingredients mixed in, and the final two eggs mixed in after this. Okay. I re-read the recipe. This just does not sound correct to me. It sounds like the whole thing is going to deflate, as the only thing holding the mixture up is stiffly beaten egg white. Shouldn’t everything added following the step where this is achieved be delicately folded in? But I put my game face on, and get to it. I will follow this recipe exactly as written in the text. 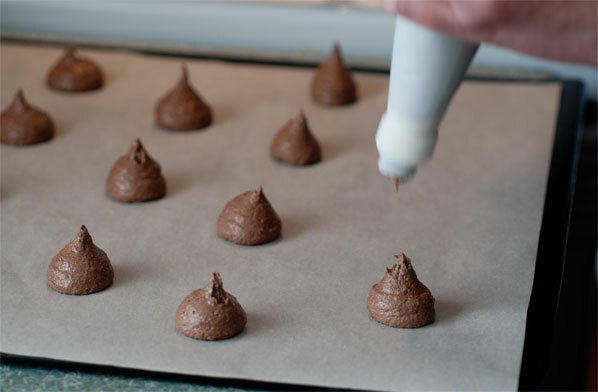 I carefully weigh all my ingredients, I add them at exactly the correct temperature … and I have a runny batter at the end, which pours out of my piping bag and onto the cookie sheet in flattish circles. 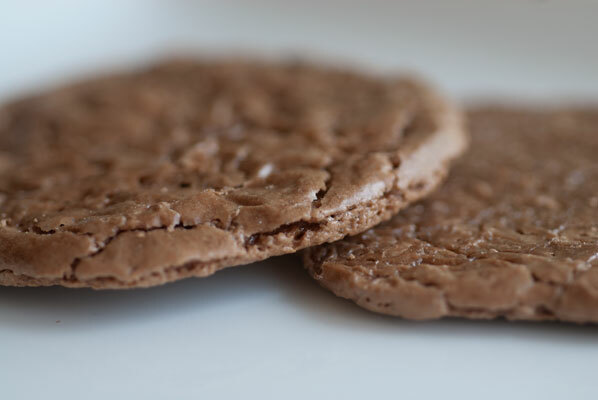 I bake these, and they do puff slightly, but I am left with gooey discs. I baked them for twice the recommended time (thinking perhaps the amount of batter used in each cookie ended up being twice the quantity suggested for each one in the recipe). They taste better the next day, once they have hardened, but as far as I am concerned, they fall into the “Epic Fail” category. In the meantime, I have made the ganache to go between the cookies. It is utterly delicious, with a smooth rich mouth-feel, and lovely buttery dark taste. I have to stop myself from scooping it directly from the bowl into my mouth. In examining the outcome of this, there are a couple of possibly reasons for failure. Either I misinterpreted the steps in the recipe. Having re-read it three times since preparing it, I have to say, I followed the steps as they were written, but the method didn’t feel correct. I do know that even the most wonderful and thorough cookbook authors occasionally have recipe glitches, whether in the printing or perhaps in translation, and I think this may have happened here – but if so – it’s a big one. Undaunted, and with a bowl of exquisite ganache begging to be sandwiched, I turned to my computer and two hours later, found myself reeling from all the conflicting advice on how these cookies must be made to produce the perfect one, with un petit pied (a little foot) along the bottom, crunchy on the outside, and meltingly soft on the inside. – no simple syrup required, and since he had already spent hours baking batch after batch of them, employing all the different variables I had read about, rather than re-invent the wheel, here is his excellent good-tasting recipe. I did not use his ganache recipe, have already made an excellent bowlful of it. Finely chop up the chocolate, and place it in a generous sized heat-proof bowl. Heat the whipping cream, until small bubbles form around the edge of the pan. 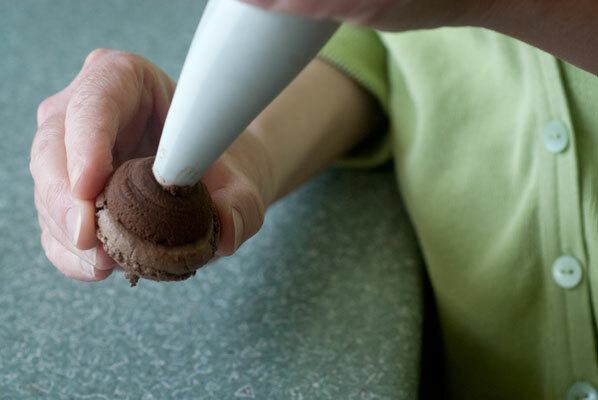 Pour the cream onto the chocolate, in five additions, mixing in well, after each addition. Add the butter, in small additions until it too, is combined in to the mixture, and the mixture is smooth and glossy. These macarons piped out onto the mats in stiff happy little mounds, and perhaps because I was afraid of collapsing them, I did not push down their peaks. Most of them came out of the oven with these little peaks intact, and looked, not so much like the lovely little ovals I see in shops, but more like acorns! 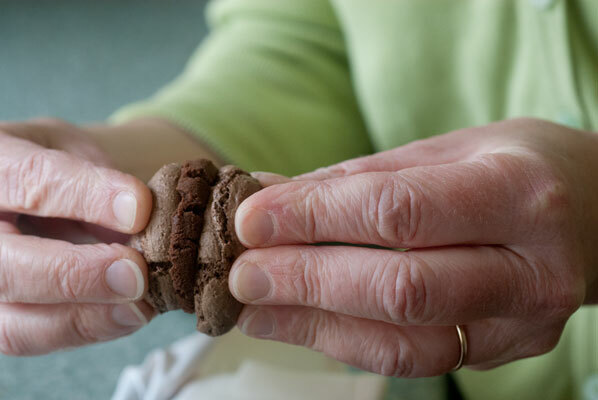 When sandwiched together, it was impossible to set them on a flat side. They had to be placed sideways, and rolled merrily around on the plate. It occurred to me that next time I attempt macarons, perhaps I will use hazelnuts, and celebrate this double-acorn shape. One variation my son and I did end up making to some of the cookies, was to place a fresh raspberry onto one cookie after it had ganache piped on to it, just before smashing the other cookie down on top. Since the raspberries are so juicy and fresh, this really has to be done just before serving them. Alternatively, shoving a couple of raspberries in our mouths, at the same time as biting a macaron proved to be almost as tasty! Perhaps not quite as iconic as Marcel Proust’s “episode of the madeleine” (in Remembrance of Things Past), the taste of these macarons is still very sweet.